I am a super happy, excited, curious, playful, friendly puppy looking for a home with people with big hearts! Hi! My name is Grover!! I love to hike, play, and cuddle! 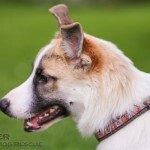 My foster dad says I’m like a super playful teenager – I’m young, and I like plenty of playtime every day! I am VERY smart, and I’m super fast at picking up on what my foster parents want me to do (or what they don’t want me to do). My foster mom is a student, so sometimes she needs to study – if I ask her to play when she’s studying, I’ll just cuddle up next to her for a nap so she can get her work done! I am so loyal and loving, and I try to be very good! I am still very much a puppy, so to siphon off that energy and give me the benefit of canine socialization, CDR has put me into doggy daycare. I LOVE IT!! I have a best friend there and we will play and play and play and play….until the staff have to make us take some “quiet time” because we don’t even realize we’re tired! I am both housebroken and crate trained. I am fine in a crate, and my foster parents leave me in one when they have to go to out and when they sleep. My foster parents keep me in a crate as a matter of training, because once or twice I’ve gotten my puppy mouth around things that it shouldn’t. That said, I really need someone who will make sure I get lots of daily exercise AND with experience in positive training. 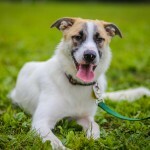 I have a lot of energy to burn, and I need a positive outlet – like daycare or another young playful dog in the house! I also really need someone who can let me know what the boundaries are, and help me stick to them. I am a VERY good boy, but if I don’t know the rules and you don’t encourage good puppy etiquette, I can’t follow them! My foster parents call me a big lover. I love almost everything! I’m very social, love people, love dogs, and love love love love car rides!! Did you know if you stick your head out the window, you can feel the cool breeze? Whoooosh!! I looooove playing tug of war, chewing on bones, fetching toys for catch, and wrestling with my favorite toy, a pet stuffed dragon. (I need tough toys to stand up to my love to chew!!) I especially love peanut butter filled Kongs (a frozen treat I’ll nibble on for hours!). It’s really good to have these sorts of toys around, because I love to chew and it focuses my energy on something positive! My foster parents say I am missing a leg… but I don’t believe them!! I will walk, run, and play like any normal puppy!! I handle stairs like a champ (unless they are slippery/smooth surfaces)! Nothing slows me down! I’m perfectly okay with short walks every day, but I need some way of siphoning off my energy every now and then, like going to the dog park or going on a hike. My foster parents take me hiking every other day, and I have never had any trouble. And dog parks!! I love them!! When I can find a play buddy at the dog park I will run, jump, and play until I’m totally pooped after an hour. I would love a doggie brother or sister to play with in my forever home!! I am very good at taking cues from other animals on whether or not they want to play or just chill out. At the dog park I’ll run and play with the other pups, or just hang out with the old dogs and smell new smells. I’d be fine in a house with cats. My foster parents have two cats, and I’m very curious about them but know to be on my best manners! I sometimes army-crawl over to them on my belly, then flip over to show them my belly so they know I want to be friends! Sometimes, when the cats are feeling better around me, I will occasionally touch noses with the braver cat. While always well meaning, I am not super coordinated and probably would not do well around small children who might want to roughhouse with me. I can sometimes be mouthy when I play, which is another reason my forever home shouldn’t have small kids in it. I don’t need a fenced yard, though I’d like one! As long as I can go to the dog park, on twice daily walks, and get my exercise in some way, I’ll be happy. I was hit by a car when I was very young, and the vets couldn’t save my back leg. But don’t feel sorry for me, I barely miss it! Other than that, I’m super awesome and healthy, just your regular ol’ puppy! 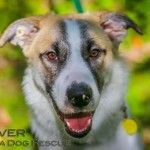 If you are interested in adopting Grover, please fill out an online adoption application and live close to Ithaca , Syracuse, Binghamton, or Elmira. We do home visits on every applicant, and can’t do home visits where we don’t have local volunteers. good with cats, good with dogs, good with kids, large, male, young. Bookmark.